He is one of the Cātummahārājāno (The Four Kings of the Four Directions). King of Uttarakuru (the North). His royal residence is Āḷakamandā and his citadel Visāṇa. His messengers are Tatolā, Tattolā, Tatotalā, Ojasi, Tejasi, Tatojasi, Sūra, Rāja, Ariṭṭha and Nemi. His lotus-lake is called Dharaṇī. His sons are all called Inda. He rules over the northern clime and is lord of the Yakkhas, with a splendid retinue. He is a follower of the Buddha. In literature the name Kuvera signifies the god of wealth, and his city, Āḷakamandā is said to embody all prosperity. 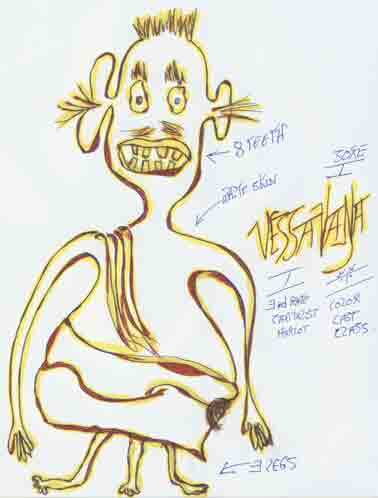 He is also known as Vessavaṇa from the name of his kingdom. He appears in the Āṭānātiya Sutta of the Digha Nikaya where he delivers the Āṭānātiya rune for the protection of bhikkhus. He is a sotāpanna and has a lifespan of 90,000 years..
Vessavaṇa is not the name of aparticular being but of the holder of an office. When one Vessavaṇa dies Sakka chooses another as his successor. See also Hare's AN 7.50, where footnotes #5, 6, 7, and 8 deal with him and where referencing the commentaries it is stated he is a streamwinner, is symbolized by the Lion, is the God of Wealth, and was, at the time of Gotama 9,000,000 years old. See note above. According to AN 8.42 (see Hare: AN 8.42) The lifespan of the Cātummahārājāno, of which he is one, is calculated as follows: each fifty years of mankind is a single night and day; their month has thirty of those nights, their year twelve months the lifespan of those devas consists of five hundred celestial years, each equal to that year. That would be: 50X30X12X500 = 9,000,000 human years. And that is the calculation for the retinue of these gods, the Four Kings themselves are likely to have longer lifespans. If the note cited above is correct though, he appears to be near the end of his lifespan and could be reborn hear at any time give or take a few thousand years.